“Help! I need somebody…” to tell me, is it real or is it lip-synching?! “Beatlemania” redux in this incredible live performance that replicates every note in the original key. Playing nightly (Mon-Sat. 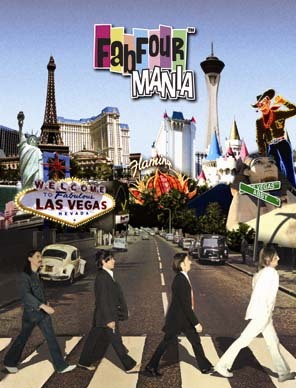 7:00pm) in the Sahara Showroom, David Saxe’s current Las Vegas production, “Fab Four Mania”, does, however, distinguish itself from the late 70’s Broadway hit “Beatlemania”. Entering the showroom off the Party Pit Blackjack lounge which boasts lava lamps, tie-dye t-shirted dealers and a Beatles soundtrack (all in full swing when the show lets out at 8:15PM), show-goers immediately get the vibe, taking a photo-op in front of the groovy, painted VW mini-bus located at the theater entrance. Beatles trivia questions displayed on large monitors stage right and left amuse and occasionally stump audience members already seated, awaiting the show’s start. Functioning as M.C. for the evening, impersonator/comedian Paul Terry gives audiences his best Ed Sullivan, introducing the Lads from Liverpool, and padding the costume changeovers with routines that manage to evoke late-60’s colloquialisms, while also satirizing the genre with a knowing wink. The faux Fab Four hit the ground running from their opener, offering up some of the Beatles’ earliest hits while the crowd keeps busy throughout, providing syncopated claps during “8 Days a Week,” twisting at their seats for “Twist & Shout,” and singing along with many other standards. The next act segues into psychedelic Sgt. Pepper/Magical Mystery Tour territory. Crank up the distortion! While paying accurate tribute to the most recognizable hits from those years, the set might benefit even further by pulling out a gem less often re-visited, such as “Fixing a Hole,” and reminding audiences that not every song in the Beatles catalog evolved into muzak. Ringo does get his due in Fab Four drummer Tony Felicetta’s sweet rendition of “A Little Help from My Friends”. Before the final act Steven Craig (A.K.A. John Lennon) takes to the piano for a solo “Imagine”. While all the fans in attendance heartily concurred with Craig’s heartfelt expressions of grief and outrage over Lennon’s fate, the maudlin speech may momentarily take the show’s tone down a notch more than it deserves. Remarks emphasizing Lennon’s life, rather than the nature of his death, might enhance the effectiveness of this set piece. Not to mention that “Imagine,” a selection from Lennon’s post-Beatles solo career, digresses somewhat from the “Fab Four Mania” concept. Beatles tracks such as “Let It Be”, “Strawberry Fields”, “Come Together” all aptly evoke Lennon’s personal spirit and philosophy equally well. Nevertheless, Craig’s “Imagine” gives fans an accurate and respectful recreation of the beloved classic track. And the choice not to insert any cheesy video montages, but rather let the music stand on its own, proves correct. Further kudos rightfully go to FFM’s video producers. Instead of trotting out oft-seen shots such as the Beatles arrival in the U.S., or visiting the Maharishi, this show provides a number of off-beat selections. Nostalgic clips of the real Penny Lane and surrounding area expand the reminiscent quality of that number. A spliced together Beatles song medley performed by British men/women on the street proves another clever resurrection from the vintage vault. 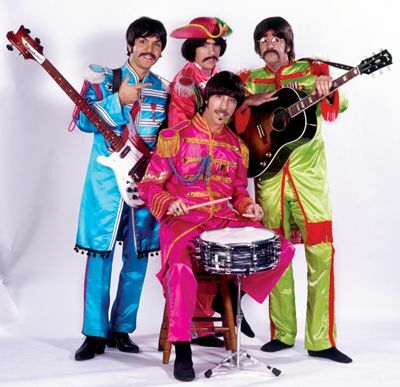 Frank Mendonca III as Paul, and real-life Liverpool native Gavin Leslie as George round out the group along with the aforementioned Felicetta (Ringo) and Craig (John). Together these four talented musicians in their own right present the total package of looks and sound. 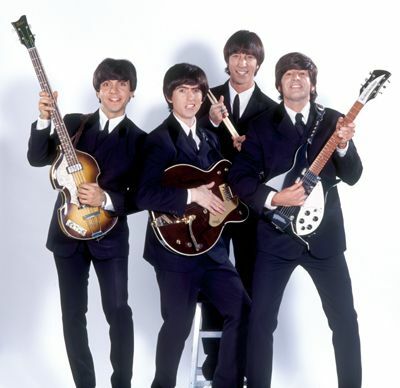 It’s all here: Paul’s south-paw, upside-down bass, John’s trademark splay-legged stance, Ringo’s hang-dog look belying the redoubtable technique behind the backbeat, and George’s shy forays to the forefront for his ingeniously economical guitar riffs. Since the music never really went away, the songs throughout “Fab Four Mania” strike a chord with both original Beatles fans and their offspring — the perfect respite from “A Hard Day’s Night” in Las Vegas!